(Or rather My selected excerpts of history) because who could explain every major and miner event? Old dock near the site of the Seminole War Fort Anne, a blockhouse which guarded the old Haulover Canal. 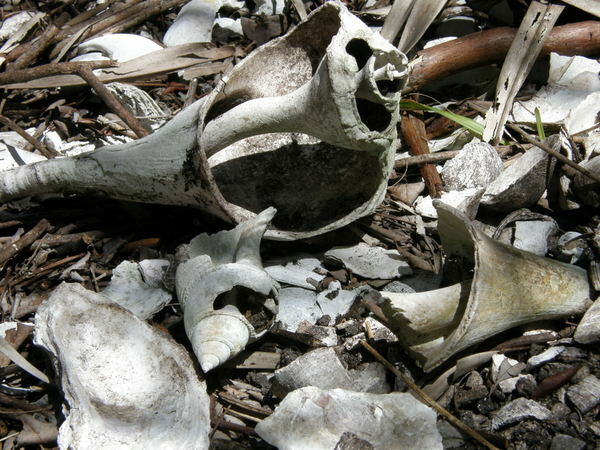 Shell midden (Native American shell garbage pile) exposed along the Banana River by feral hogs. Another reason to like bacon. 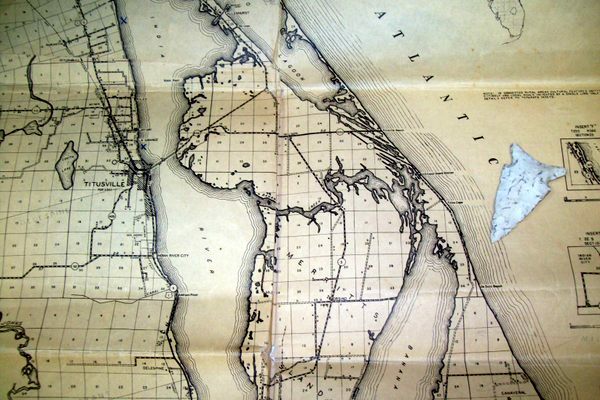 Yes, as a history addict, I always find it interesting that many of the internet pages about the history of the Indian River Lagoon (the Indian and Banana Rivers and the Mosquito Lagoon begin their history around 1860. Where would I start with the history of the Lagoon system? I would start my history of the Indian River when there was NOT an Indian River. No lagoon but a winding stream on a wide prairie where the IRL exists today. 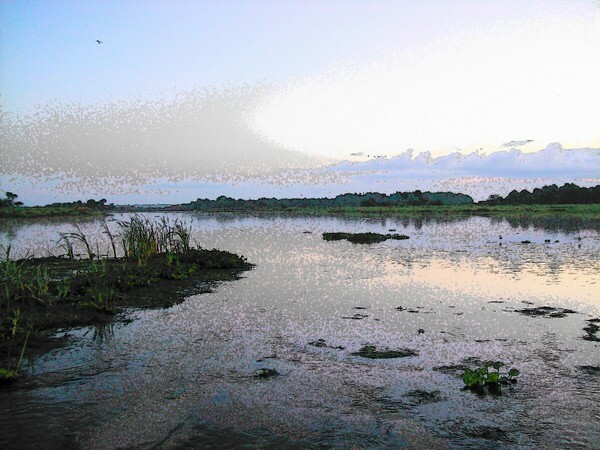 A few miles from the western shore of the IRL is the burial pond site named Windover. 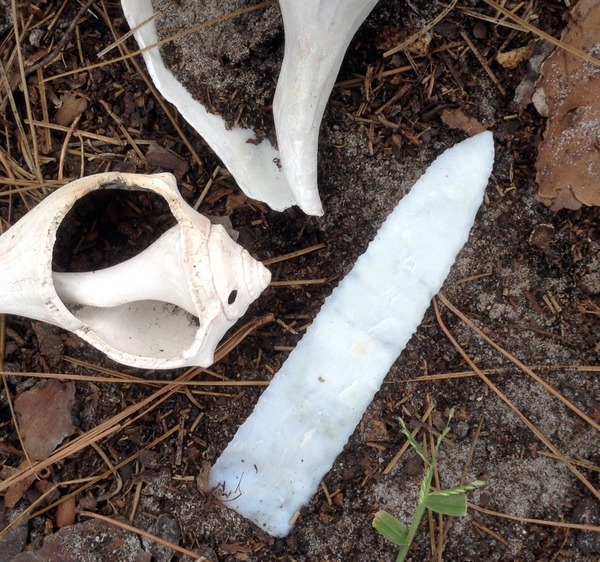 This boggy cemetery is approximately 7-8000 years old and the discovery of 168 water burials and amazingly preserved burial artifacts placed east central Florida prominently into the archeological books and maps of Native American history. **Woven fabrics- the oldest-known in the world. X is one of the five haplogroups found in the indigenous peoples of the Americas. Why do I bring up the Windover site when the subject is the history of the Indian River Lagoon? Many efforts were made to locate the settlements of the archaic Windover people but with no success. 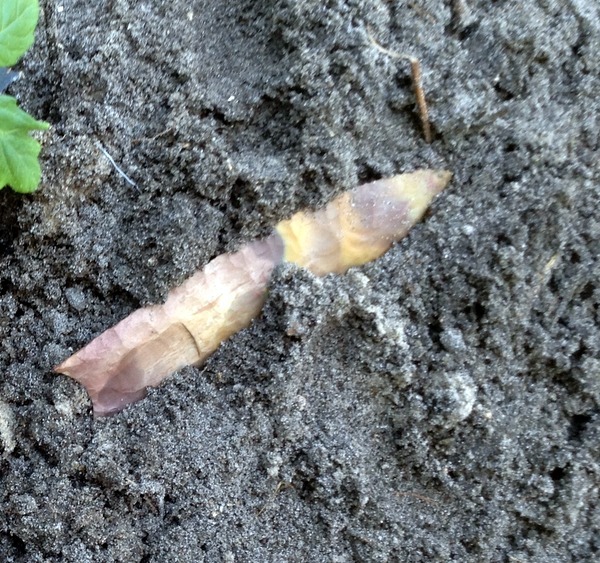 A common problem with locating any pre-agriculture settlement from the archaic period is that people were by necessity following seasonal food sources -be it winter ducks, hickory nuts, wild grapes or Florida monk seals. Permanent settlements are rare with archaic people. 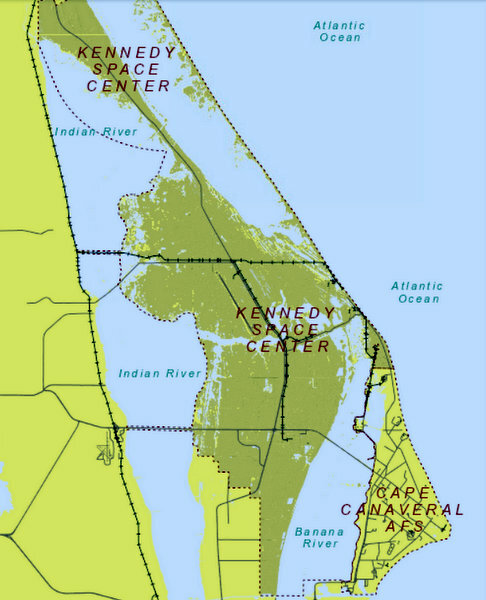 As to the location of the Windover villages; eventually a general consensus was reached by archeologists that the village or villages-if they exist are under the brackish waters of the Indian River somewhere between Kennedy Space Center and the town of Titusville. In other words I might be paddling over "Windover Town" every weekend! For most people it comes as a surprise that the wide Indian and Banana Rivers did not yet exist at the time of the Windover burial pond! That the IRL did not exist might be a surprise or even a difficult concept to understand. However during the last ice age the area known as Florida was doubled in size because the towering ice age glaciers had locked up such vast quantities of water that the ocean levels were lowered. The Florida east coast shoreline was perhaps thirty five miles to the east and the western shoreline was nearly one hundred miles further into a greatly reduced Gulf of Mexico. Before the shrimp industry destroyed that fishery, the shrimp nets would on occasion pull up bones from Mammoths and camels from under the gray blue Atlantic water. And on most underwater terrain maps, you can trace most modern rivers (relic river beds) where they once twisted their way to a waterfall on the continental shelf. A few years ago on Kennedy Space Center- during construction of the FPL solar farm, was the discovery of the bones of a 10,000 year old llama only a few miles from the ice age version of the Indian River. Gradually during a global warming phase the ice sheets released their captive water and the oceans slowly rose to present day levels. Eye-witness account of the formation of the Indian River some six to seven thousand years ago. A story of fiction, but why not? Evidence of the rising sea levels comes from the fact that the first saltwater shell fish middens (shell garbage piles) on the IRL are dated to around 5500 years ago (the arrival of the ocean and flooding of the fresh water Paleo Indian River. So what about this lost history? Lost to cold blue waters of history? Some interesting hints still remain. My conception of a paleo fresh water stream that once flowed on the present site of the Indian River Lagoon. This 1936 chart show the outline of the paleo 'lost' river by depth measurements. The white "deeper water shows an earlier version of the IRL. "The black line" I drew is the visible ancient 'channel' that can be seen on Google Maps. The reason there is narrow lost river and the wider lost river? (the white outline) It is fairly easy to identify the original stream and the wide spot (deeper water) may represents an ancient marsh along the edges of the fresh water stream. However I believe the white markings represent the first saltwater intrusion into the prairie at the lagoon's conception. The Ocean was still rising at first breach into the prairie. 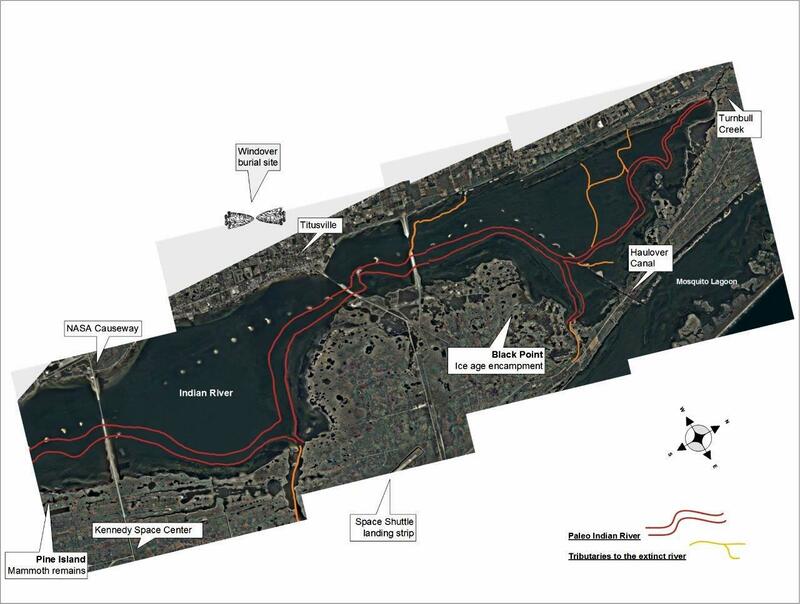 The map shows the paleo feeder streams of Banana Creek and Sam's Creek on Pine Island. 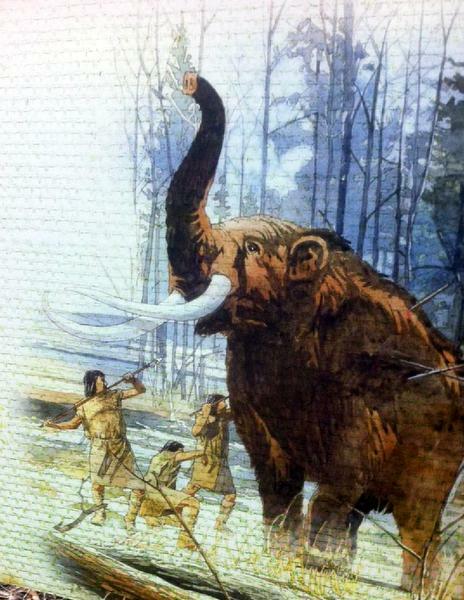 I do get a kick out of the very common artist concept that an elephant/mastodon/mammoth would just stand around and get speared. 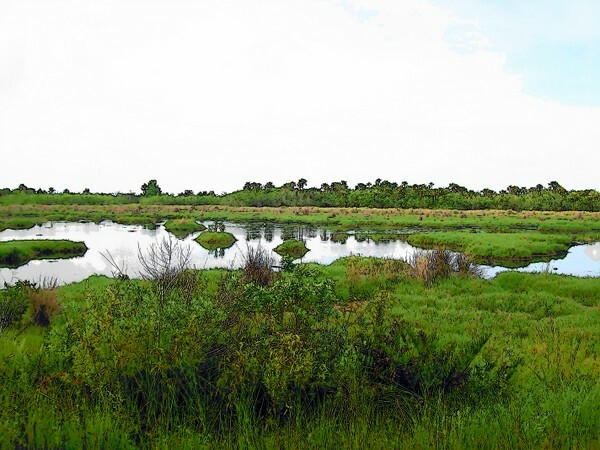 The importance of what I call the Paleo Indian River can be seen by the discovery of the only paleo-Indian archeological site on Kennedy space center-near Black Point wildlife drive. (a wetlands now, but once was the shore of this paleo (lost) river. The Windover site villages would have most likely been situated along this lost River and artifacts continue to be discovered at random locations on the Indian River spoil islands. This is a better version of the lost paleo Indian River (creek) with the two main tributaries of Turnbull Creek & Dummit Creek. (my apology for the drawing size-this web page is formatted for cell phones and my maps are shrunk to minuscule size) I added the Windover site and KSC for reference. Oldest human location on KSC is on Black Point drive near Dummit Creek. 1933 "Pre Space Center Map" shows the current three northern IRL rivers and shows Banana Creek before it was closed to create the Crawler-way to the launch pads for the Apollo moon Rockets. Finally a further study of google maps or any tool which shows the terrain of the ocean floor demonstrates the presence of Paleo lagoons just off shore of Cape Canaveral as well as earlier versions of the cape itself. These lagoons can be located and seen as flat ovals nearly the same size of the current lagoons & surrounded by ancient sand dunes and ridges. 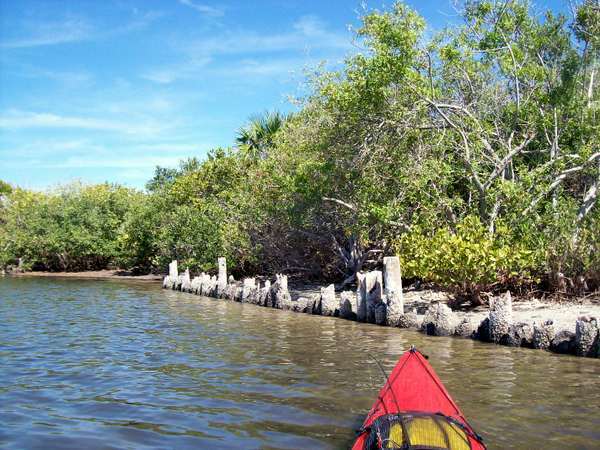 At least two of these ancient "Ghost" lagoons can be seen off shore of the cape and a larger version of the Banana River just below the cape -off shore from Cocoa Beach. What stories from hunters of the ghost lagoons and Paleo rivers have been lost to time? What villages flooded that resulted in "great flood" stories? What remains to be discovered in the waters that surround Kennedy Space Center? Truly interesting waters we paddle over. There seems to be a cluster of stone artifacts along the lagoon, not found along other parts of the east coast. The type of artifacts that pre date the IRL by nearly 7000 years...Why this cluster?..... During the Ice Age, this river would have attracted game and associated predators. Wolves, lions and the recently arrived Paleo-Americans. 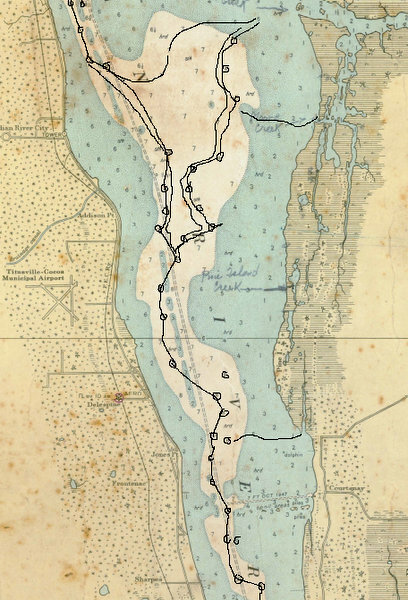 "History of the Indian River Lagoon" page.